“Bucket brigade” chain of volunteers passing the items up the ladders. On April 18, 2016, we filled Level 8 of the Mahabodhi-style stupa at Land of Medicine Buddha. Our regular stupa volunteers were joined by some of our Sunday-morning meditators to create a “bucket brigade” going from truck to ladder to ladder all the way to the top, handing items over head. 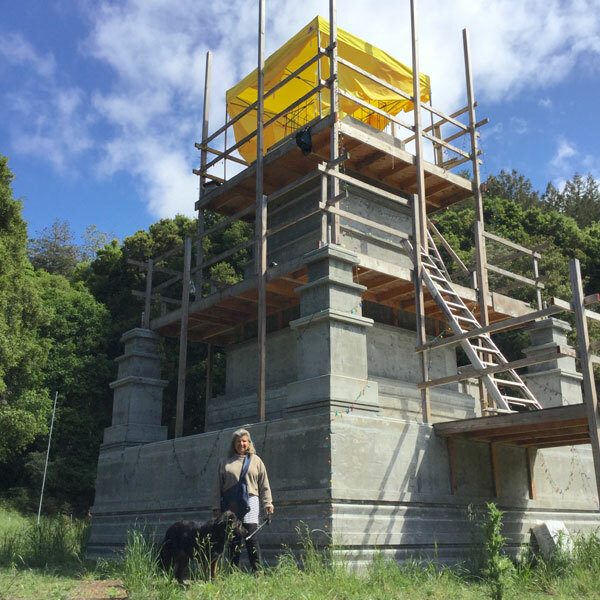 With Carolyn and her dog in front, you can see the scale of the stupa. Sangha members from Lama Zopa Rinpoche’s house in Aptos were a big help in actually placing the holy objects in careful order into the chamber. The items in Level 8 are similar to before: 1 set of the Kangyur (collection of Buddha’s teachings), many rolls of microfilm (of the Stainless Pinnacle mantra and the Four Dharmakaya Relic mantras), more boxes of tsa-tsas (plaster cast images of buddhas), and other printed materials. Having filled seven previous chambers, this one seemed like a breeze. Now, there is just one more level to fill to complete the central tower. Then, a more classic bell-shaped stupa will go on top. Gelek works on smaller stupas. 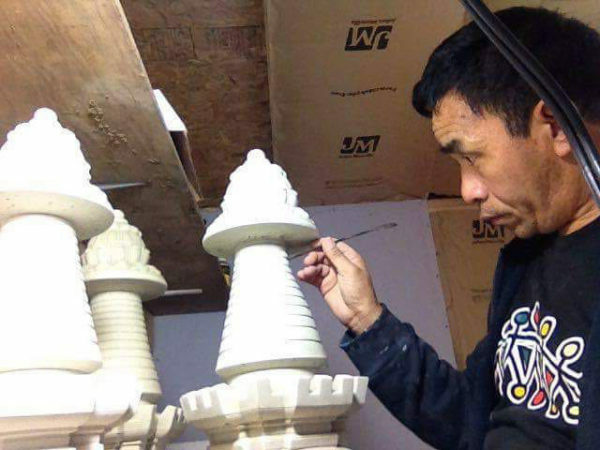 Gelek, our resident artist has returned from several months in Asia, and is now casting the smaller stupas that will be affixed on the four corners. Contact our director, director@medicinebuddha.org, if you want to be involved in this project. 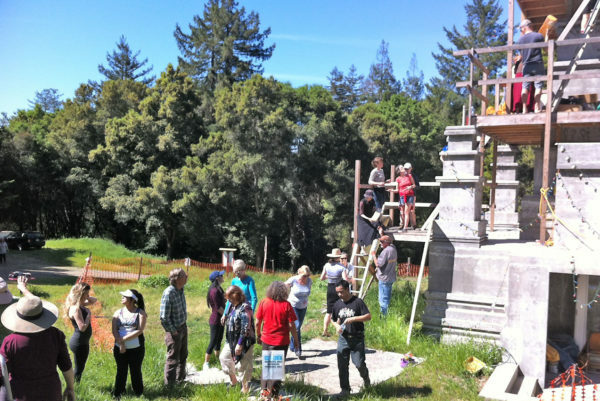 See more on the Stupa Project page.